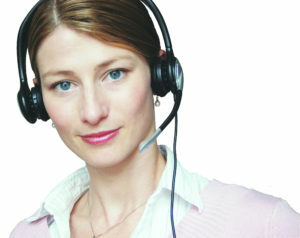 Are you searching a more sensitive, better reproducible, and timesaving replacement for post-stains? The powerful T-Rex protein label combines excellent performance and photostability over a wide pH-range of 2-11. It is therefore ideally suited for high performance visualization of protein samples separated in 2D gels. In contrast to green fluorescence protein stains or labels the red fluorescence of T-Rex causes almost no background. Therefore the signal-to-noise ration of T-Rex is much better compared to most other fluorescence products on the market. T-Rex labeled proteins do not interfere with antibody recognition and mass spectrometry. T-Rex labeled proteins can be perfectly transfered to a blotting membrane (0.22 or 0.45 µm, NC or PVDF). 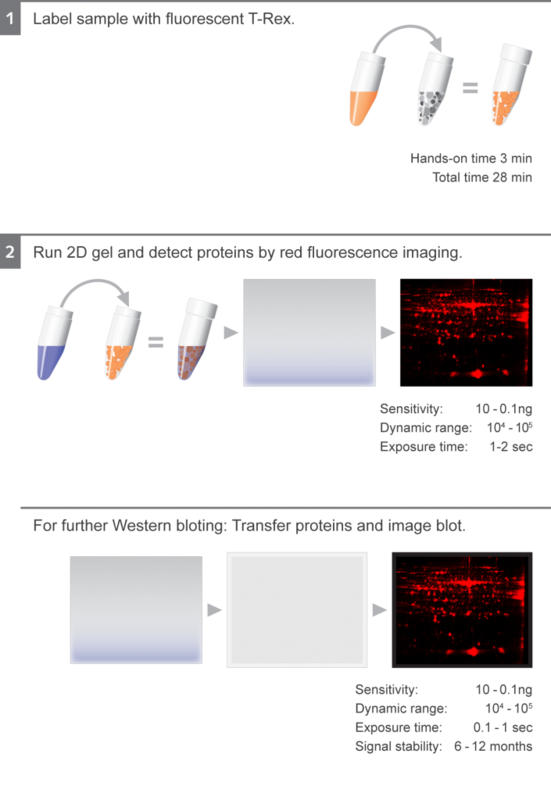 The transfered protein is than detectable by rapid fluorescence imaging during all steps of the Western Blot analysis (e.g. after the transfer, after the target detection). To detect the target we recommend HRP-secondaries + for chemiluminescence or Immuno Blue Fluorescent Substrate or fluorescent secondaries. T-Rex labeled proteins do not interfere with antibody recognition and mass spectrometry. The combination of T-Rex label and phospho- or glycostains respectively allow for powerful identification of differentially regulated phospho/ glycoproteins. The T-Rex labeled sample provides an reliable internal standard (with no specs or gel suffering due to additional staining/ destaining) thereby offering reliable phophorylation/ glycosylation studies. The combination of 2D Western Blots and fluorescence protein labels is the most powerful method for the analysis of host cell proteins (HCP). All cell proteins are pre-labeled with the T-Rex fluorescent label, seperated by 2D electrophoresis and then transfered to a Western Blot membrane.The following Western Blot analysis and fluorescence/ chemiluminescence detection allows to presicely discriminate the overexpressed proteins from the host cell proteins by anti-HCP antibodies.The HCP coverage analysis is then automatically performed by a quick software overlay. T-Rex kits are ready to use and come as 20 separated vials each for labeling of 50 µg of protein including T-Rex solvent. T-Rex labeling vs. Coomassie® blue staining. 50 μg of protein derived from E. coli were labeled with T-Rex fluorescent label. Another 550 μg of unlabeled protein were added to the sample. The proteins were separated by 2D gel electrophoresis. T-Rex was detected with the Octopus QPLEX imaging device by red epi fluorescence excitation. The gel was stained with Coomassie® blue and then re-imaged by white transmission light. T-Rex labeling + ProQ® Diamond phosphoprotein staining. Two samples á 50 μg of protein were labeled with T-Rex fluorescent label. The two samples were separated by 2D gel electrophoresis. The T-Rex labeled sample proteins were detected by the Octopus QPLEX imaging device using epi fluorescence excitation. 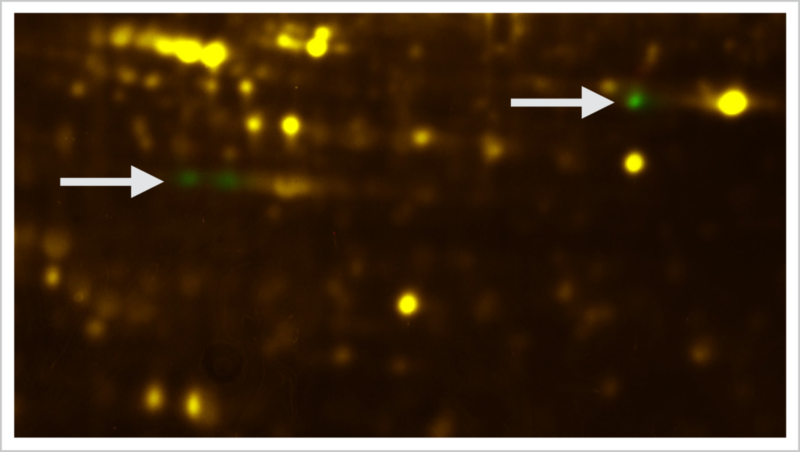 The two gels were then stained with ProQ® Diamond phosphoprotein gel stain (Thermo Fisher) and then imaged by epi green fluorescence. The two phosphoprotein images were warped (Delta2D, Decodon) using the T-Rex as internal standard. The arrows indicate differentially expressed phosphoproteins of the two samples.